In X-Men: The Last Stand, the Phoenix is shown as a part of Jean's subconscious that needed to be "walled off". Is this the case in the comics as well, or is the Phoenix a separate entity that takes Jean over? It's an entity, and an overpowered one as is. The Phoenix Force is an immortal, indestructible, and mutable manifestation of the prime universal force of life, derived from the psyches of all living beings. 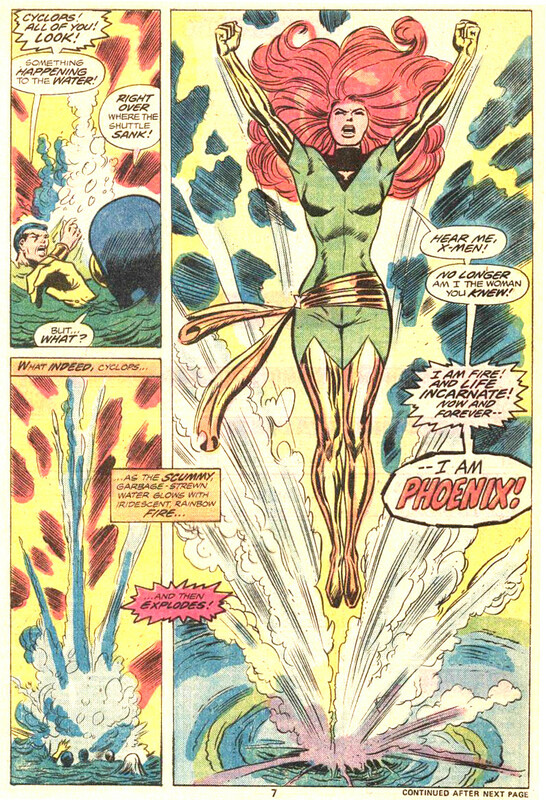 Basically, the thing exists as is and does not need a physical body, but for various reasons (notably as an workaround when it can't be in its natural state due to some kind of a jinx) it can take over a human, Jean Grey being the main one, though alternate realities have her daughter Rachel Summers to be the Phoenix. It's worth underlining that the "entity takes over" thing might not be quite what one would think: in its first appearance, the Phoenix Force didn't just pick Jean Grey because he liked redheads and boomed itself over her consciousness. Jean was dying, and they sorta made a pact where it resurrects her by duplicating her body. Jean being quite mentally strong, they happen to share it. Long story short, after Jean is taken over by a villainous psi, Phoenix lashes out and becomes Dark Phoenix. Jean dies, is resurrected, dies, is resurrected, as comics go... Phoenix takes over other hosts, but is always linked to Jean. was overrun by the Phoenix presenting her an other life than her own, but eventually breaks out of it thanks to the X-Men actions. She then completely lets go of the Phoenix, never to allow it to be with her again. Until Marvel writers decide to scratch that and make an other run, of course, but that's another question. But, Jean had indeed "phoenix traits" before encountering it. Which would basically be why the Phoenix Force chose her as its host. Her powers are pretty much infinite even without adding Phoenix Force juice to them. I guess an almighty entity wouldn't want a lower-class mutant (or even worse, a regular Homo sapiens!) as its host. Not the answer you're looking for? Browse other questions tagged marvel comics x-men adaptation-comparison phoenix-force or ask your own question. Were any of the Avengers involved the last time the Phoenix came to Earth? Why didn't Iron Man's Phoenix Alarm go off? Is the X-Men lair protected/insulated against psychic activity/attacks? How did Wolverine manage to approach Phoenix?